Hot summer days call for cool food! Try one of these summer salads–perfect to pack up and take with you on your summer adventures. Summer swim team has started, which means lots of eating on the run–either out at away meets or spending hours at the home pool. Rather than spend lots of money at snack bars and overdo it on unhealthy foods, the kids and I searched on Pinterest for some new-to-us cold salad recipes that we can prep in the morning and pack to take for dinner. We love our old standby, the Spinach & Feta Pasta Salad, but we’re eager to try something new. These Super Summer Salads look great! The sweet & sour dressing soaks in when you chill this salad ahead of time, so make it the night before or early in the morning for a crunchy, delicious dinner by the pool. This has all the flavors my kids love–chickpeas, cucumbers and salty feta cheese, with a light homemade dressing to pull it all together. Yum! So simple, and with kid-favorite green beans plus garden tomatoes and orzo pasta. This would be good both warm and cold. Can’t wait to try it! Love the pizzazz of the dressing, made with almond milk and apple cider vinegar. If you have leftover grilled chicken, put a few slices on top for protein. You had me at bacon. This chop salad also includes lettuce, arugula, corn and avocado–a fabulous medley of flavors–with a simple olive oil & lime dressing. 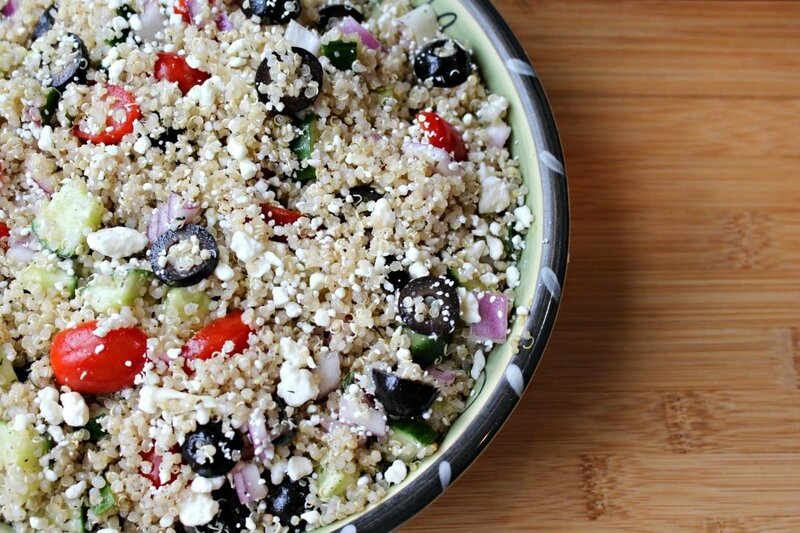 Quinoa is a nice change from pasta in salads, and we love how it soaks up the homemade dressing. It’s also a great source of protein! For more easy family meals, read Get Dinner on the Table FAST. I also have more delicious salad recipes pinned to my Salads & Veggie Sides Pinterest Board. Super Summer Salads is linked up to Pinterest Foodie at Real: The Kitchen and Beyond and Fluster’s Creative Muster Party at Fluster Buster. This is a wonderful selection for summer! I am one huge fan of salads because it quickly becomes too hot to turn on the oven. OH my gosh those look AMAZING!! Thank you for sharing them. Now- to get them made… STAT. Each one sounds delicious. I made the “summer broccoli” salad tonight, and oh my it was so yummy! A new favorite for sure! Thanks for sharing! I’ll be sure to try some of the others as well.